"...A great place to spend some time!" "Every turn in this house is a bit of an adventure." "Architectural whimsy and frank elegance." 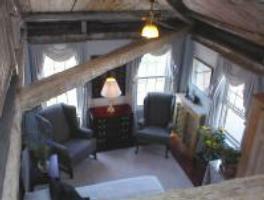 On the second floor, with its view of Gloucester Harbor, is the Cut Stevens Suite. Located in the oldest part of the house, this suite is perfect for the adventuresome of spirit and the young at heart, with a king-sized bed and a spiral staircase that wends its way between ancient beams and weathered eaves to an extra sleeping loft with twin mattresses. 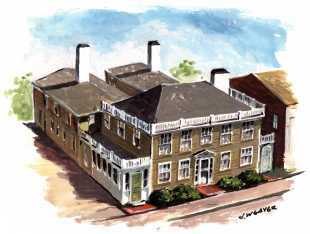 On the East side of the oldest part of the house,on the second floor, is the William Friend Suite. 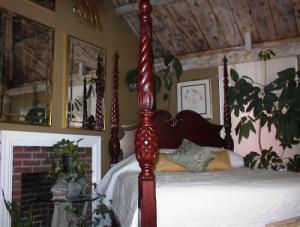 Like the "Cut" Stevens Suite to the West, its sleeping area (with queen four-poster) and breakfast area have a panoramic view of the harbor. The inner sitting room contains a sleigh trundle and the breakfast kitchen. All four walls are enhanced by a floor to ceiling mural of exotic reeds, by Jeff Weaver. Off this inner room is the bath for the suite, as well as an extra bedroom (with twin trundles) called the Bordello Room. This room can be added to the suite when appropriate.